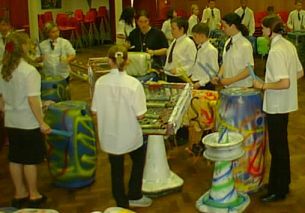 Big Beat offer exciting junk percussion workshops for schools and other youth organisations. The workshops are devised and led by members of the internationally renowned Big Beat, and focus on developing creativity, self-esteem, teamwork and performance skills. Eye opening!! Money well spent! Absolutely fantastic!! The pupils loved every second. Key elements explored within the workshops include, multi-cultural rhythms, music from recycled junk, how sounds are created and composition. 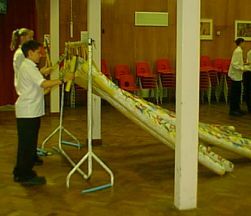 We provide a multi-coloured array of instruments made from gas pipes, plastic barrels, dustbins, shopping trolleys, metal bins, wooden and metal chimes, everything in fact - including the kitchen sink! By the end of the session we will have created an unusual, unforgettable orchestra ready to perform the finest junk funk! Fresh, innovative, captivating. The workshops engaged pupils and staff alike. Final celebratory performance - 15 mins approx. The workshops are energetic, fun and very noisy. If you are planning to continue with junk music after the workshop we can also provide you with a set of basic junk instruments. If the weather allows it is possible to work outside. It is expected that the class teachers / youth workers will be present throughout the workshop. [Your] input into the musical development and interest of children in the area and knowledge of composition and performance within different music styles of music was greatly appreciated. The unique contribution that you made to the to the week was enjoyed by all. I am pleased to say that you . . provided access for ALL children into the area of music making - no expense necessary!! Live performance have certainly enhanced the children's musical development and intrigue and helped to promote music throughout the school. 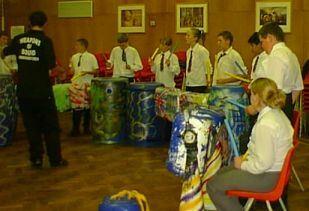 Big Beat can also supply Samba music workshops which bring the infectious carnival rhythms of Brazil to your school / youth group and will again focus strongly upon the development and encouragement of musical creativity, expression and teamwork skills. I just wanted to tell you how much everyone appreciated the workshop. [The facilitators] managed the children brilliantly and everyone is still buzzing from the experience. Most of the kids had a smile on their faces all day long and now they can't wait to form their own junk band. They left us with a fantastic memory that will stay with us all for a very long time.